Triple negative breast cancer (TNBC) is aggressive with limited treatment options upon recurrence. Molecular discordance between primary and metastatic TNBC has been observed, but the degree of biological heterogeneity has not been fully explored. Furthermore, genomic evolution through treatment is poorly understood. In this study, we aim to characterize the genomic changes between paired primary and metastatic TNBCs through transcriptomic and genomic profiling, and to identify genomic alterations which may contribute to chemotherapy resistance. 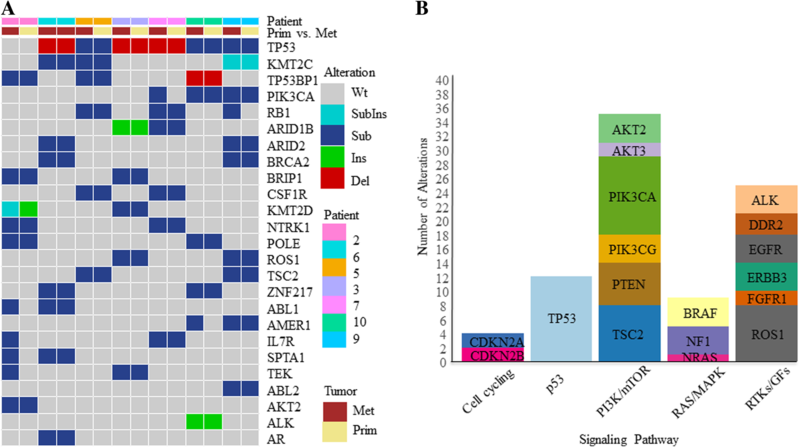 Genomic alterations and mRNA expression of 10 paired primary and metastatic TNBCs were determined through targeted sequencing, microarray analysis, and RNA sequencing. Commonly mutated genes, as well as differentially expressed and co-expressed genes were identified. We further explored the clinical relevance of differentially expressed genes between primary and metastatic tumors to patient survival using large public datasets. Through gene expression profiling, we observed a shift in TNBC subtype classifications between primary and metastatic TNBCs. A panel of eight cancer driver genes (CCNE1, TPX2, ELF3, FANCL, JAK2, GSK3B, CEP76, and SYK) were differentially expressed in recurrent TNBCs, and were also overexpressed in TCGA and METABRIC. CCNE1 and TPX2 were co-overexpressed in TNBCs. DNA mutation profiling showed that multiple mutations occurred in genes comprising a number of potentially targetable pathways including PI3K/AKT/mTOR, RAS/MAPK, cell cycle, and growth factor receptor signaling, reaffirming the wide heterogeneity of mechanisms driving TNBC. CCNE1 amplification was associated with poor overall survival in patients with metastatic TNBC. CCNE1 amplification may confer resistance to chemotherapy and is associated with poor overall survival in TNBC. Triple negative breast cancer (TNBC) is an aggressive type of breast cancer (BC) characterized by a high rate of recurrence and poor overall survival upon cancer metastasis [1, 2]. Hormone-receptor positive (HR+) BCs and HER2-positive (HER2+) BCs harbor well-defined and targetable biomarkers. Despite the identification of at least four molecular TNBC subtypes, including basal-like 1 (BL1), basal-like 2 (BL2), mesenchymal (M), and luminal androgen receptor (LAR) [3–5], these subtypes have not proven clinically useful due to the intrinsically complex and heterogeneous biology of TNBCs. With the exception of PARP inhibitors for patients with BRCA1/2 germline mutations, and unlike HR+ or HER2+ BCs, there is no effective targeted therapy available to treat TNBCs. In addition to tumor heterogeneity, the biology of TNBC is further complicated by tumor evolution through selective pressure. The molecular evolution of TNBC as the result of chemotherapy and/or radiation-induced selection pressure is well recognized but poorly understood . Molecular discordance between primary and metastatic TNBCs has been observed, but the degree of biological heterogeneity has not been fully explored . Recurrent/resistant BC may differ from primary tumors at multiple levels. Several previous studies demonstrated phenotypic discordances between primary and metastatic tumors in the standard-of-care biomarkers estrogen receptor (ER), progesterone receptor (PR), and HER2 [8, 9]. Discordance of other molecular markers such as PIK3CA mutations was also identified [9, 10]. Cyclin E1 (CCNE1), along with its catalytic subunit CDK2, plays a critical role in cell cycle regulation, DNA replication, chromosome segregation, and the G1 to S-phase transition [11, 12]. 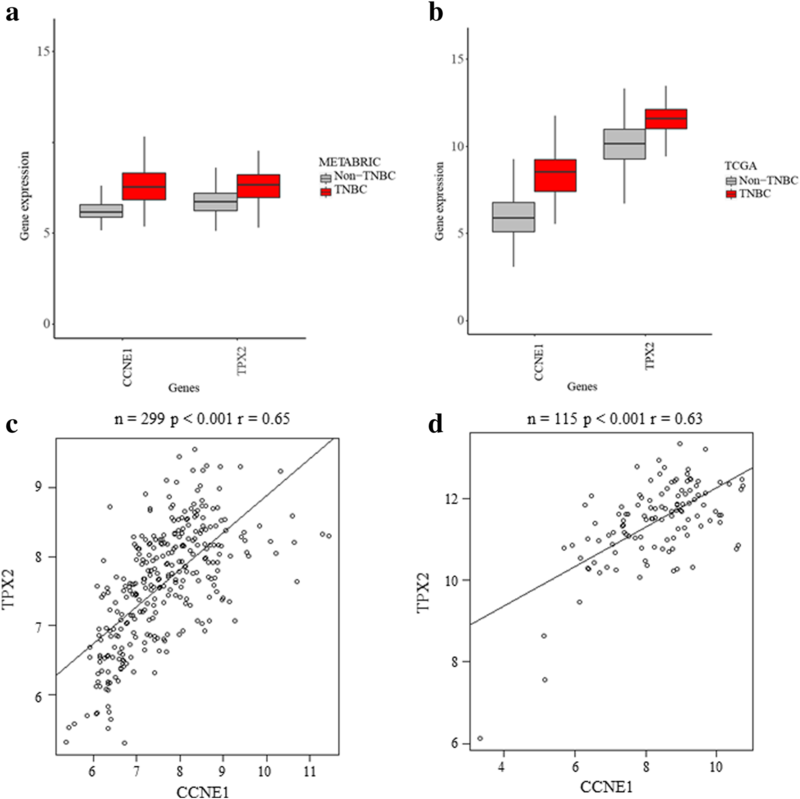 CCNE1 amplification is associated with primary treatment resistance in high-grade serous ovarian carcinomas (HGSCs) and co-amplification of TPX2 with CCNE1 was common [13, 14]. CCNE1 amplification is also associated with resistance to HER2-targeted therapy in HER2+ BC . However, the role of CCNE1 in TNBC is not well understood. Genomic and transcriptomic discordance between primary and metastatic tumors have the potential to reveal novel drivers of metastatic progression, and aid in the selection of late-line therapies . Genomic sequencing has revealed subclonal diversity of primary BCs and chemotherapy-resistant BCs in experimental models , but such findings have not been shown in patient tumor samples. Available large-scale public genomic databases from The Cancer Genome Atlas (TCGA) project  and the Molecular Taxonomy of Breast Cancer International Consortium (METABRIC)  have significantly improved our understanding of breast cancer tumor biology. These data sets contain only newly diagnosed and chemotherapy naïve tumors as opposed to complementary longitudinal primary and metastatic samples. Therefore, genomic characterization of longitudinal samples has the potential to identify novel driver mutations and therapeutic targets. The primary goal of this study is to characterize the genomic changes between paired primary and metastatic TNBCs through sequencing and mRNA expression profiling, and to identify genomic alterations which may contribute to chemotherapy resistance. Paired primary and recurrent TNBC specimens were identified through an IRB-approved protocol from patients with recurrence between 2002 and 2015. Eligible patients had the following features: stage I - III TNBC; at least one tumor biospecimen available from initial surgery or biopsy; at least one specimen available from a recurrent/metastatic disease; and treatment and clinical outcome data available for chart review. Two cohorts of patients were studied: “Pilot-TNBC” (n = 10) and “Discovery-TNBC” (n = 55). All pathology samples were formalin-fixed and paraffin-embedded (FFPE). Demographic data such as age, gender, date of birth, date of diagnosis, date of relapse, and date of death or last follow-up (if applicable) were obtained for CCNE1 amplified patients (n = 13, 6 from “Discovery-TNBC”, and 7 from clinical report). Disease characteristics such as tumor grade, TNM stage, and ER/PR/HER2 status, as well as treatment variables including surgery, chemotherapy, and radiation therapy were also obtained. Paired primary and recurrent TNBC samples were profiled using the Affymetrix Human GeneChip® 2.0 in the “Pilot-TNBC” cohort. Robust multi-array averages (RMA ) were calculated from mRNA expression, summarized at the gene symbol level (23,945 gene symbols) based upon probe-set annotations (instead of transcript clusters) with the Affymetrix Power Tools software . Messenger RNA (mRNA) expression across control probe transcript clusters was also summarized (27,293 control probes). Gene symbol annotations for probe sets were downloaded from the Affymetrix website. When comparing expression between primary and recurrent samples, p-values were calculated using the limma R package  and false discovery rate (FDR) values were calculated using the method of Benjamini and Hochberg . The number of differentially expressed genes was maximized by considering genes with RMA > 2 in at least 50% of samples, |fold-change| > 1.5 between averaged recurrent and primary tumors, and FDR < 0.25. The ratio of gene expression between paired recurrent and primary TNBCs was reported as fold-change. Heat maps and clustering of differentially expressed genes were created using the ‘seaborn’ package under Jupyter Notebook Python 3. For better visualization, we only reported fold changes between − 10 and 10. TNBC subtyping was performed using the online TNBC Type tool from Vanderbilt University Medical Center . Of the “Discovery-TNBC” cohort (n = 55), RNA isolation and expression profiling were performed for 35 paired primary-metastatic specimens. Total RNA was isolated from FFPE specimens using the QIAGEN miRNeasy FFPE kit. RNA integrity (RIN) and DV200 scores were determined using an Agilent Bioanalyzer. Per Illumina protocol, TruSeq RNA Access Library Preparation was performed, and libraries were enriched for mRNA fraction by positive selection, prior to paired-end 2 × 100 sequencing on the Illumina HiSeq. Using the R package “edgeR version 3.20.9” [25, 26], raw transcript counts were converted to log2-counts per million (log2CPM), dataset-wide lowly- or non-expressed genes were removed, and transcript expression was normalized to ensure similar expression distributions across the dataset. Genomic alterations in FFPE specimens from primary and recurrent TNBCs were detected using the FoundationOne™ sequencing panel. FoundationOne™ identifies base substitutions, insertions and deletions (indels), amplifications with copy number ≥ 6, and rearrangements. The FoundationOne™ sequencing panel version used herein included the entire coding regions of 395 cancer-related genes, and select introns of 31 genes that are rearranged or altered in cancer, capable of achieving a median sequencing depth greater than 500X [27, 28]. Gene expression of 1904 samples from METABRIC (299 TNBC and 1605 non-TNBC) using Illumina HT-12 arrays were downloaded . Whole-transcriptome sequences of 1091 primary breast cancer (115 TNBC and 976 non-TNBC) and 112 normal cases in TCGA were downloaded in the format of ‘illuminahiseq_rnaseqv2-RSEM_genes_normalized (MD5)’ from FireBrowse . Boxplots for gene expression comparisons in METABRIC  and TCGA  datasets were created using the R “ggplot” package. TCGA data were transformed to log2 of the gene expression value plus 1, to make them the same scale as the METABRIC gene expression data. P-values were independently calculated using Wilcoxon and ANOVA tests to compare between two, and among multiple groups, respectively. Kaplan-Meier (K-M) curves were generated for overall survival (OS) and relapse free survival (RFS), where OS is defined as time from surgery to death, and RFS is defined as time from surgery to disease recurrence. The log-rank test was used to examine survival (OS or RFS) difference based on CCNE1 copy number alteration (CN ≥ 6 vs. CN < 6), or CCNE1 mRNA expression (median gene expression as a bifurcation). The clinical characteristics, pathological features, treatment histories, and survival of the “Pilot-TNBC” cohort are described in Table 1. The majority of the tumors were infiltrating ductal carcinomas (IDC) (80%, 8/10), stage I-II (70%, 7/10), and the patients received standard-of-care chemotherapy with anthracycline and/or a taxane-containing regimen. RFS ranged from 2 to 39 months, and overall survival ranged from 9 to 113 months. Molecular subtypes according to the Lehmann/Pietenpol classification were determined: BL-1 (n = 4), BL-2 (n = 1), M (n = 3), and LAR (n = 2). Four of ten TNBC pairs displayed a shift in the molecular subtype between the primary and metastatic specimens. In “Pilot-TNBC,” FoundationOne™ sequencing was successful in 7 paired specimens (n = 14) (Fig. 1a). A total of 339 genomic alterations including 73 known mutation/amplification and 266 variants of unknown significance (VUS) were identified. Genomic alterations were identified in the following signaling pathways: cell cycle, p53, PI3K/mTOR, RAS/MAPK, and RTK/GF (Fig. 1b) . There were no CCNE1 mutations or amplifications detected in the “Pilot-TNBC” cohort. Detailed genomic alteration data is listed in Additional file 1: Table S3. In addition, there was significant inter-patient genomic heterogeneity but little intra-patient variability. These findings not only confirm the genomic heterogeneity of TNBCs, but also highlight the genomic stability of these tumors over the course of time. To identify genes driving cancer recurrence, gene expression patterns were studied by comparing the paired TNBCs in “Pilot-TNBC.” We found 455 differentially expressed genes (DEG) between metastatic/primary TNBCs (> 1.5 fold changes), with 317 genes upregulated and 138 genes down-regulated in the metastatic TNBCs compared to their matched primaries (Fig. 2a). From the 455 DEGs, the expression of 8 cancer-related genes (CCNE1, TPX2, GSK3B, CEP76, SYK, JAK2, ELF3 and FANCL) was significantly upregulated in recurrent/metastatic TNBCs compared with matched primaries (Fig. 2b). These genes represent potential cancer driver genes, selected based on putative cancer driver gene lists from literature [27, 30–34] and/or inclusion in the FoundationOne™ targeted sequencing panel. There was no clear association between expression pattern of these genes and Lehmann/Pietenpol subtypes of TNBC (data not shown). We next analyzed whether genes upregulated in TNBC metastases had systematic expression patterns across breast cancer datasets. To further understand genomic and transcriptomic expression of CCNE1 and TPX2 in primary TNBCs, public databases including METABRIC and TCGA were used. TNBCs exhibited higher mRNA expression of both genes compared with non-TNBCs. In METABRIC, the percentage of tumors with CCNE1 mRNA overexpression (above median) is significantly increased in TNBCs (42.1%, 126/299) compared with non-TNBCs (3.2%, 51/1605) (p < 0.0001). In TCGA, similar results were found in TNBCs (48.7%, 56/115) compared with non-TNBCs (7.2%, 70/976) (p < 0.0001). In METABRIC, TNBCs also exhibited higher TPX2 mRNA overexpression (22.4%, 67/299) compared with non-TNBC (2.4%, 38/1605) (p < 0.001). In TCGA, similar results were found for TPX2 mRNA overexpression in TNBCs (40.9%, 47/115) compared with non-TNBCs (7.6%, 74/976) (p < 0.0001) (Fig. 3a and b). In addition, CCNE1 and TPX2 are co-overexpressed in TNBC (METABRIC, n = 299, p ≤ 0.001; TCGA, n = 115, p ≤ 0.001) (Fig. 3c and d). Furthermore, CCNE1 is significantly co-overexpressed with TPX2 in “Pilot-TNBC” and “Discovery-TNBC” cohorts (p < 0.001) (Additional file 2: Figure S2). However, CCNE1 or TPX mRNA overexpression in TNBCs did not confer a difference in OS (data not shown). In METABRIC, TNBCs also exhibited significantly higher mRNA expression of FANCL (p < 0.0001), SYK (p < 0.0001), ELF3 (p < 0.01), JAK2 (p < 0.0001), and GSK3B (p < 0.0001) compared with non-TNBCs (Additional file 3: Figure S1a). There was no significant change in CEP76. In TCGA, TNBCs exhibited significantly higher mRNA expression of FANCL (p < 0.0001), SYK (p < 0.0001), and CEP76 (p < 0.0001) compared with non-TNBCs (Additional file 3: Figure S1b). No significant changes in ELF, JAK2 and GSK3B were observed. Further, compared with normal tissue, median mRNA expression of these eight genes was significantly elevated in breast cancer tissue (Additional file 3: Figure S1c). In the “Pilot-TNBC” cohort, CCNE1 amplification was not observed. Further analysis of an independent cohort of “Discovery-TNBC” revealed CCNE1 amplification (CN ≥ 6) in 6 of 55 (10.9%) patients (primary and metastatic tumors). The clinical characteristics and outcomes of these patients with CCNE1-amplified TNBC are summarized in Table 2. Patients with CCNE1-amplified tumors presented with advanced stage disease and had poor pathological responses to neoadjuvant chemotherapy. None of these patients had BRCA1/2 mutations. There is a statistically significant association between CCNE1 amplification and poor OS (p = 0.023) (Fig. 4a), but not RFS (p = 0.25) (Fig. 4b). Of the “Discovery-TNBC” cohort (n = 55), whole-transcriptome sequencing (RNAseq) was successful in 35 paired primary-metastatic specimens. Of those, 25 specimens exhibited an increase in CCNE1 mRNA expression in metastatic samples compared to their primary counterparts. No association between CCNE1 mRNA over-expression and OS was observed in the “Discovery-TNBC” cohort (p = 0.45) (Fig. 4c). We further examined the association of CCNE1 gene expression and CCNE1 gene amplification in both primary and metastatic tumors (Fig. 4d). 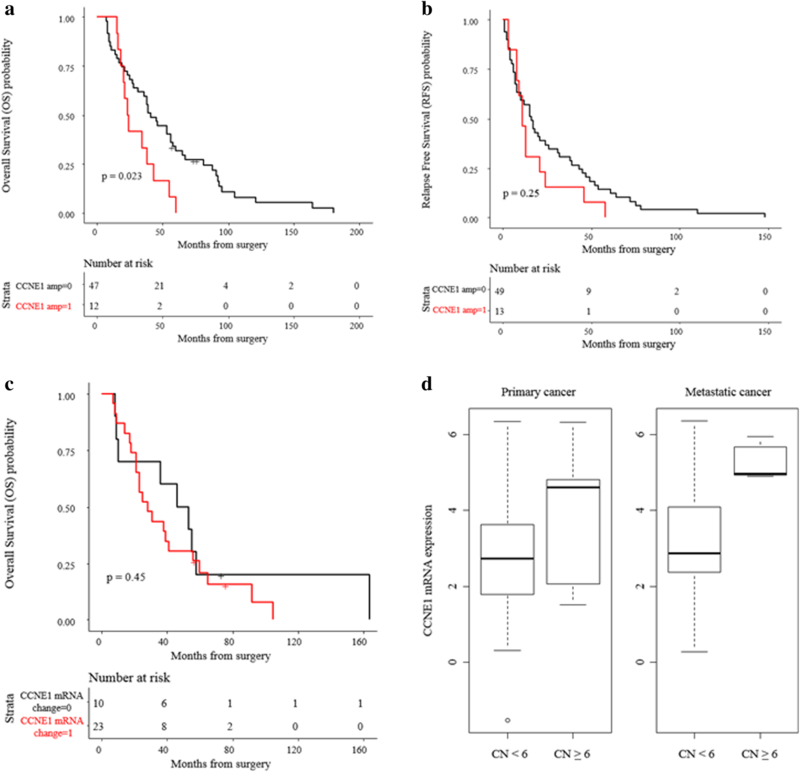 In tumors with no CCNE1 amplification (CN < 6), the mean and variance of CCNE1 mRNA expression were comparable between primary and metastatic tumors. However, the mean CCNE1 expression in metastatic tumors was increased compared to primary tumors (expression = 5.29 vs. 3.87, SD = 0.49 vs. 2.02). CCNE1 amplification was more frequently detected in TNBCs (9%, 27/299 in METABRIC and 10%, 11/111 in TCGA) compared to non-TNBCs (1.7%, 27/1605 in METABRIC, p < 0.0001 and 3.5%, 33/962 in TCGA, p = 0.0055), but these distinctions did not translate into significant OS differences, likely due to limited sample sizes. In TCGA, TPX2 amplification was more frequent in TNBCs (8.1%, 9/111) compared to non-TNBCs (1.5%, 14/962) (p = 0.0004), but not in METABRIC. Interestingly, reflective of our “Discovery-TNBC” cohort data, CCNE1 amplification in TNBC is mutually exclusive with BRCA1/2 mutations in both METABRIC and TCGA breast cancer databases. Tumor genomic evolution is frequently observed due to selection pressure imposed by chemotherapy. We hypothesize that studying paired primary-metastatic TNBCs at the genomic and transcriptomic levels may lead to a better understanding of the underlying mechanisms behind chemotherapy resistance. Herein, we report mRNA expression profiling and targeted DNA sequencing data from paired primary-metastatic TNBCs in a “Pilot-TNBC” cohort and an independent, expanded “Discovery-TNBC” cohort. Despite largely concordant gene expression levels, 8 putative cancer driver genes were significantly upregulated in metastatic samples compared to their matched primary specimens. 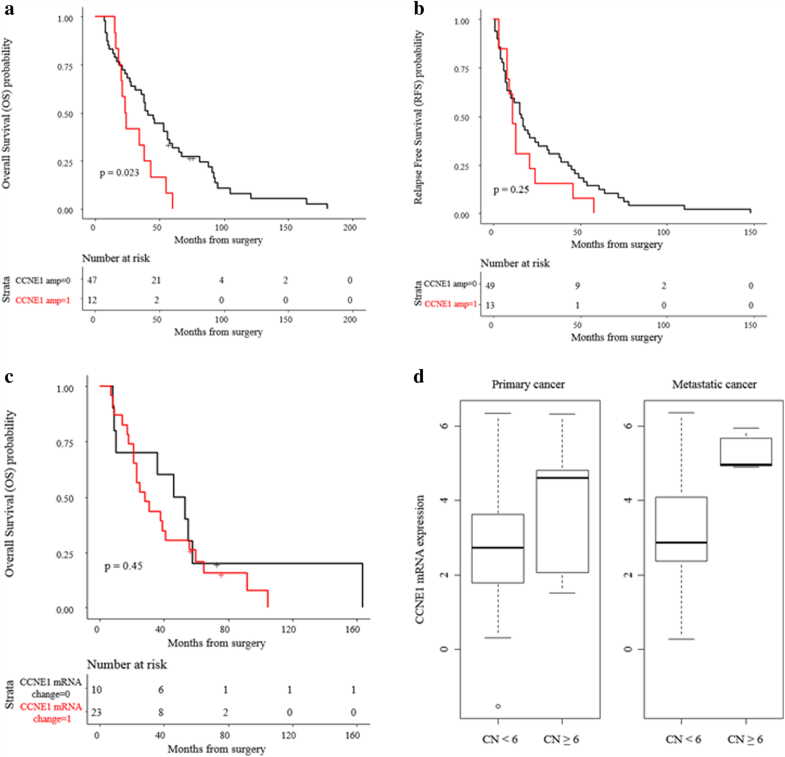 Furthermore, CCNE1 amplification was associated with poor overall survival in the “Discovery-TNBC” cohort, highlighting CCNE1 amplification as a possible mechanism of chemotherapy resistance. TNBCs are extremely heterogeneous. In an effort to better understand and categorize TNBCs, several molecular classifiers were developed (i.e. Lehmann/Pietenpol  and Burstein ). Although these classifiers have improved our understanding of TNBC tumor biology and helped distill scientific analyses into outputs that are more easily interpretable, none have led to changes in clinical practice. Herein, we identified so-called “molecular phenotype shifts” between select primary and metastatic samples from our “Pilot-TNBC” cohort, but a universal shift in TNBC pheno-subtypes was not observed. The clinical application of these findings requires further investigation. Previous studies have reported variable findings upon comparison of primary and metastatic tumors. Some revealed concordant expression patterns between primary breast cancers and their matched synchronous lymph nodes [16, 35–37]. Vecchi, et al. found that expression of a specific gene set could differentiate between primary tumors and synchronous metastases . However, Weigelt, et al. studied seven cases of primary breast cancer and asynchronous distant metastases and showed that a 70-gene prognostic signature was generally maintained in the switch from primary to metastasis across most of the pairs . Several studies used targeted NGS to address genomic concordance between primary and metastases. Meric-Bernstam and colleagues reported that 86.6% of the somatic mutations and 62.3% of the copy number variations were concordant between primary tumors and recurrences . These studies suggest that it may be necessary to study circulating tumor DNA (ctDNA), which is thought to be more representative of the mutational spectrum of the entirety of a patient’s metastatic disease rather than a biopsy of a single metastatic lesion . Furthermore, noncoding RNAs and epigenetic modifications could also play an important role in the metastatic process [16, 41, 42]. Cyclin E and its associated CDK2 are essential for cellular progression through the G1 phase of the cell cycle and initiation of DNA replication. CCNE1 amplification induces chromosome instability through persistent DNA replication and centrosome duplication [43–45]. CCNE1, along with its catalytic subunit CDK2, plays a critical role in cell cycle regulation to assure precise control of DNA replication, chromosome segregation and the G1 to S-phase transition [11, 12]. CCNE1 amplification is mutually exclusive with BRCA1/2 mutations and correlates with cyclin E1 protein expression in ovarian cancer [46–48]. CCNE1 amplification occurs in approximately 20% of high-grade serous ovarian carcinomas (HGSCs) [13, 14] and is associated with primary treatment resistance and poor outcome in these tumors . Cyclin E1-specific pharmacological inhibitors are not yet available, although indirect CCNE1 targeting trials are ongoing. However, small molecule inhibitors do exist for CCNE1’s counterpart in the cell cycle, CDK2. The pan CDK inhibitor, dinaciclib (SCH-727965), inhibits CDKs 2/5/1/9 and is being tested in clinical trials for hematological and solid malignancies (NCT00798213 and NCT00937937) [50, 51]. In addition, a WEE1 inhibitor AZD1755 is being tested in solid tumors with CCNE1 amplification (NCT03253679). In a study of HGSC, expression of TPX2, a centromeric protein required for mitotic spindle function, was highly associated with CCNE1 amplification . In our study, CCNE1 and TPX2 were co-overexpressed in metastatic TNBCs compared to paired primaries. This finding is similar to previous results in ovarian cancer, where co-overexpression of CCNE1 and TPX2 were found to be related to clonal resistance to chemotherapy . Mutual exclusivity of BRCA1/2 mutation/deletion and CCNE1 amplification has been shown previously in ovarian cancers . Despite limited sample size, our finding of mutual exclusivity of CCNE1 and BRCA1/2 genes is worth further investigation and may help clinicians select patients for personalized treatment. High cyclin E1 expression has been considered in other studies as a biomarker of poor clinical outcome in breast cancer [15, 52]. In a study of patients with HER2+ disease, CCNE1 amplification/overexpression resulted in worse survival and CDK2 inhibition could overcome trastuzumab resistance in xenograft models . Hunt, et al. demonstrated that overexpression of cytoplasmic low molecular weight cyclin E (LMW-E) is associated with poor survival in patients with breast cancer . Because it lacks a nuclear localization domain, LMW-E accumulates in the cytoplasm, where it binds to CDK2 and retains kinase activity . Our study provides further evidence of the association of CCNE1 amplification and poor OS in patients with recurrent TNBCs. CCNE1 mRNA was significantly upregulated in metastatic compared to paired primary TNBCs. Although no survival differences were observed, this may be reflective of the limited sample size. This study features a combination of well-annotated clinicopathologic and genomic data, which allowed us to directly identify clinically relevant genomic information. However, our study is limited by sample size, lack of unified treatment variables, and retrospective nature. We did not study noncoding RNAs nor epigenetic changes within the tumors. Finally, although patient-matched, singular biopsies do not represent a complete picture of metastatic disease. Overall, our study is hypothesis-generating and these results will benefit from verification with a larger cohort of patients and more comprehensive technologies and tumor biology assessments such as ctDNA analyses. In this study, comparison of paired primary and metastatic TNBCs demonstrates heterogeneity of molecular mechanisms of gene expression underlying TNBC recurrence. Amplification of CCNE1 is associated with poor OS in patients with metastatic TNBC. CCNE1 amplification may serve as a target for therapeutic intervention in chemotherapy-resistant TNBCs. Jeffrey H. Chuang and Yuan Yuan contributed equally to this work. This study was supported by STOP Cancer Foundation, NIH K-12 Career Development Award K12CA001727 (Joanne Mortimer MD), and National Cancer Institute P30CA034196, R21CA191848, and U24 CA224067 (Jeffrey H. Chuang PhD). Research reported in this publication included work performed in the Pathology and Biostatistics Core supported by the National Cancer Institute P30CA033572 Award. The content is solely the responsibility of the authors and does not necessarily represent the official views of the National Institutes of Health. The authors would thank Dr. Edison T. Liu and Dr. Francesca Menghi from The Jackson Laboratory for the discussion of data interpretation. This study was supported by STOP Cancer Foundation, NIH K-12 Career Development Award K12CA001727 (Joanne Mortimer MD), and National Cancer Institute P30CA034196, R21CA191848, and U24 CA224067 (Jeffrey H. Chuang PhD). METABRIC and TCGA are publicly available databases. Normalized mRNA expression data for “Pilot-TNBC” cohort is available in Additional file 4: Table S1, normalized mRNA expression data for the “Discovery-TNBC” cohort is available in Additional file 5: Table S2, and genomic alteration data for the “Pilot-TNBC” cohort is available in Additional file 1: Table S3. ZMZ contributed to study conception, data interpretation, and manuscript revision; SEY contributed to data collection, data interpretation, and manuscript revision; KEH contributed to data interpretation and manuscript revision; SML contributed to data interpretation and manuscript revision; YCY contributed to data collection, data interpretation, and manuscript revision; JN contributed to data interpretation; ZL contributed to data interpretation; CW contributed to data interpretation; XW contributed to data interpretation; RMJ contributed to data analysis; JHC contributed to study conception, data interpretation, and manuscript revision; and YY contributed to study conception, data collection, data interpretation, and manuscript revision. All authors read and approved the final manuscript. All procedures performed in studies involving human participants were in accordance with the ethical standards of the institutional and/or national research committee and with the 1964 Helsinki declaration and its later amendments or comparable ethical standards. Informed consent was obtained from all participants included in the study. All tumor specimens were identified through a City of Hope IRB-approved retrospective protocol from patients consented to City of Hope Biorepository Protocol. YY has contracted clinical trials and research projects sponsored by Merck, Eisai, NoSvartis, Genentech, and Pfizer. The other authors declare that they have no competing interests. Von Minckwitz G, Hahnen E, Fasching PA, Hauke J, Schneeweiss A, Salat C, Rezai M, Blohmer JU, Zahm DM and Jackisch C. Pathological complete response (pCR) rates after carboplatin-containing neoadjuvant chemotherapy in patients with germline BRCA (g BRCA) mutation and triple-negative breast cancer (TNBC): Results from GeparSixto. 2014;1005–1005. http://ascopubs.org/doi/abs/10.1200/jco.2014.32.15_suppl.1005. Hunt KK, Karakas C, Ha MJ, Biernacka A, Yi M, Sahin AA, Adjapong O, Hortobogyi GN, Bondy ML, Thompson PA, Cheung KL. Cytoplasmic cyclin E predicts recurrence in patients with breast cancer Clin Cancer Res. 2017;23(12):2991–3002. http://clincancerres.aacrjournals.org/content/23/12/2991.